CHITUNGWIZA Central Hospital nurses yesterday temporarily downed tools and demonstrated against their boss over nepotism. 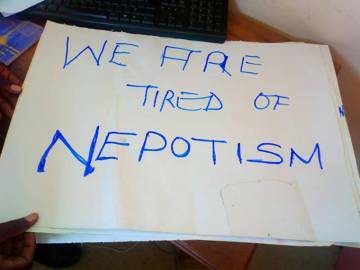 The nurses took to the car park holding placards and beating drums alleging that the principal nursing officer Miriam Mangeya had turned the institution into her empire where she surrounds herself with her relatives at the expense of other nurses. Zimbabwe Nurses Association chairperson Kingstone Mutsinzwa said nurses’ concerns had been turned off for some time forcing them to take the extraordinary measure. “Nurses are no longer safe to air their views because of relatives and friends planted by the PNO who report negatively to her,” said Mutsinzwa. Mutsinzwa said efforts to engage Mangeya were futile as she instead threatened to fire them. “VaMangeya vanobva vati panoti Chitungwiza ndopanoti inini chero ukaendepi ivondovanosara. “This has led the nurses to say enough is enough and staged a demonstration for their voices to be heard. Mandeya’s maiden surname is Muchakazi and these two surnames dominated the team selected that benefitted from the funded cholera dose programme. “Some of the general hands are from her church. “We are urging the ministry to investigate, do head counting and carry job evaluation and assess how Mandeya is administering the health institution,” he said. Mandeya is on record admitting that she had relatives employed by the hospital but said she never had a hand in selecting people who went for cholera vaccination.